I know I don’t usually do a Saturday article, but I’ve got a HUGE article that’s getting published on Monday – maybe the biggest article ever done on this site. I am not understating when I say that this might change the way you think about the Standard meta after reading Monday’s article. That’s all I’m going to say about it – it’s something that no one else is doing anywhere, and it’s going to make you a better Pokemon player. Rampardos (UP 65) caught my eye when I was evaluating the cards coming out of the Ultra Prism expansion set. I tried it a little bit at the beginning of the month but didn’t have any success (much like all of those other Stage 2 decks I tried). After having success with Buzzwole Garb Thursday, I decided to add a couple of Protein Shakes to Rampardos. I don’t think I’m telling you anything you don’t already know when I say that there’s no way that Rampardos could be anything more than a supporting attacker – you can only hope to get two Stage 2’s out at most in today’s meta. Therefore, you need another Big Basic to help fill out the deck, and this giant mosquito fits the bill. I started Talonflame in six of the twelve matches, and I went 3 W 3 L in those matches (meaning I actuallly went 4 W 2 L when I didn’t start TF… so maybe that’s something to think about). I only played Rare Candy three times in the twelve matches. I would probably take out a couple of Candy in revising this deck. I also only played Guzma a total of four times, but I’m not ready to reduce the Guzma count just yet. Everything else had at least a 20% play rate. I definitely liked the Wishful Batons, and it still amazes me how many decks apparently aren’t playing a single Leaf Blower. And I saw several E Hammers sitting unused when I would go to check my opponent’s discard pile, making me again very happy that I did not carry any Strong Energy. But this deck is just inherently not as good as yesterday’s Buzzodor deck. Just on the face of it – Garbodor BKP costs twelve cards (4 Trubbish, 4 Garb, and 4 Float Stones). Rampardos costs twenty – and that doesn’t include the Order Pads (which, btw I need to test. I need to see if they might actually increase win percentage in a decklist). Rampardos is good – 120 for a single attachment and what is essentially 250 for three attachments makes for a good attacking Pokemon. The results speak for themselves, though. Buzz Garb went 8 W 2 L and actually played against a meta deck. BuzzRamp went 7 W 5 L against a whole bunch of mediocre competition – I wouldn’t call even a single deck I faced a meta deck. But it’s a good decklist, and if you want to try out the new fossil mechanic, this is a good way to do that. Hmmm, personally I think the best way to maximize your deck’s potential would have to be to look at the decklist that PTCGRadio showcased on his channel and work from there. It might be a bit strange to see Fletchlings and a BREAK in the deck, alongside counter energy and whatnot, but the cards make sense: If Talonflame Break is needed to one shot mons, he can do just that. The thing that surprised me about your deck was the lack of Super Boost Energy which, considering Talonflame and Rampardos, are stage 2 mons that fulfill the requirement for Super Boost to be used to provide the energy needed to power up the OHKO’ing attack that Rampardos has on hand. So I would Include that in the deck as well. And having Buzzwole GX there gives up prizes, and that’s not so good. 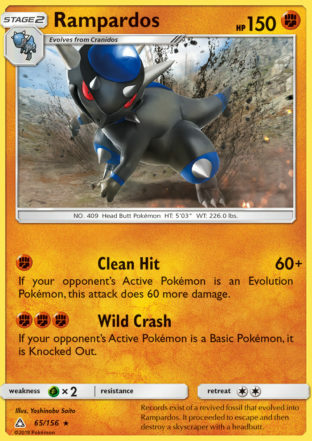 But if you already tried that build and it did not work out in your favor, then Jurassic Park is a deck that is in the same boat as Empoleon: strong, but needs a bit more to truly be a force to be reckoned with. As a side note: Hoopa/Zoroark BREAK…I’m happy to say that it kept a small win streak alive when I played with the deck this week. It’s a risky one since it runs no Lele and one Zoroark GX and Oranguru, but I did enjoy the deck. Hoopa really is getting some spotlight now, so I still don’t know why people can’t make room for the Dangerous Claws Lycanroc from Burning Shadows: one attachment, down goes Hoopa. One Strong, one Choice Band, and you do 110 for 1 on all Basic mons not weak to him. And, sigh*…..Sylveon GX coming back. which makes me hope that Pyroar next set can be a fun deck even with that fairy around (at least Metal can check her, even more so now that baby Dusk Mane came out). Lastly Bulu. It has been a solid, consistent deck in my opinion for a long time. Great to see him rising back up. Forbidden Light: Plenty of new decks are going to appear, and hopefully some decks can get the boost that they deserve.